Uranus is the seventh planet from the Sun. It is a gas giant, the third largest by diameter and fourth largest by mass. It is named after Uranus, the Greek god of the sky and progenitor of the other gods. Its symbol is either (astrological) or (astronomical). The first symbol derives from the name of its discoverer, William Herschel. The second symbol is a combination of the devices for the Sun and Mars, as Uranus was the personification of heaven in Greek mythology, dominated by the light of the Sun and the power of Mars. It is also the alchemical symbol of platinum. NASA's Voyager 2 is the only spacecraft to have visited the planet and no other visits are currently planned. Launched in 1977, Voyager 2 made its closest approach to Uranus on January 24, 1986, before continuing its journey to Neptune. Uranus is the first planet discovered in the modern era. Sir William Herschel formally discovered the planet on March 13, 1781. The other planets, (from Mercury out to Saturn), have been known since ancient times, and Uranus' discovery expanded the boundaries of the Solar System for the first time in modern human history. It was also the first planet discovered using technology (a telescope) rather than the naked eye. Size comparison of Earth and Uranus. The brightness of Uranus is between magnitude +5.5 and +6.0, so it can be seen with the naked eye as a faint star under dark sky conditions. It can be easily found with binoculars. From the Earth, it has a diameter of four arc-seconds. In larger amateur telescopes with an objective diameter greater than 12" (30cm) the planet appears as a pale blue disc with distinct limb shading, and two of the larger satellites, Titania and Oberon, may be visible. Even in large professional instruments no details can be seen on its disc. However, infrared studies of its atmosphere using adaptive optics have yielded interesting data in the years since the Voyager flyby. Uranus is the first planet to be discovered that was not known in ancient times. Sir William Herschel discovered it on March 13, 1781, but reported it as a "comet" on April 26, 1781. "On the 13th of March, 1781, between ten and eleven o'clock at night, while Herschel was examining the small stars near H Geminorum with a seven-foot telescope, bearing a magnifying power of two hundred and twenty-seven times, one of these stars seemed to have an unusual diameter; and it was, therefore, thought to be a comet. It was under this denomination that it was discussed at the Royal Society of London. But the researches of Herschel and of Laplace showed later that the orbit of the new body was nearly circular, and Uranus was consequently elevated to the rank of a planet." Although Uranus had been observed on many previous occasions, it was often mistakenly identified as a star. The earliest recorded sighting was in 1690, when John Flamsteed cataloged Uranus as 34 Tauri. Flamsteed observed Uranus at least six more times. The record belongs to a French astronomer, Pierre Lemonnier, who observed Uranus at least 12 times between 1750 and 1771, including on four consecutive nights (Lemonnier realized 9 of these within a short time of Herschel's discovery, and most of his observations occurred at the stationary point in Uranus' orbit). Herschel originally named it Georgium Sidus (George's Star) in honor of King George III of Great Britain (cf. American poet Elizabeth Graeme Fergusson's "Upon the Discovery of the Planet…" about the event). When it was pointed out that sidus means star and not planet, Herschel rebaptized it the Georgian Planet. This name was not acceptable outside of Britain. Lalande proposed, in 1784, to name it Herschel, at the same time that he created the planet's (astrological) symbol ("a globe surmounted by your initial"); his proposal was readily adopted by French astronomers. Prosperin, of Uppsala, proposed the names Astraea, Cybele, and Neptune (now borne by two asteroids and another planet). Lexell, of St. Petersburg, compromised with George III's Neptune and Great-Britain's Neptune. Bernoulli, from Berlin, suggested Hypercronius and Transaturnis. Lichtenberg, from Göttingen, chimed in with Austräa, a goddess mentioned by Ovid (but who is traditionally associated with Virgo). Finally, Bode, as editor of the Berliner Astronomisches Jahrbuch, opted for Uranus, after Latinized version of the Greek god of the sky, Ouranos; Maximilian Hell followed suit by using it in the first ephemeris, published in Vienna and computed by the Benedictine priest, Placido Fixlmillner. The earliest publication to include Uranus in its title was in 1823. The name was in use in Germany at least as far back as 1791, however. Examination of earliest issues of Monthly Notices of the Royal Astronomical Society from 1827, shows that the name Uranus was already the most common name used even by British astronomers by then, and probably earlier. The name Georgium Sidus or "the Georgian" was still used infrequently (by the British alone) thereafter. The final holdout was HM Nautical Almanac Office, which did not switch to Uranus until 1850. In the Chinese, Japanese, Korean, and Vietnamese languages, the planet's name is literally translated as the "sky king star," while in India it is named Aruna, the charioteer of the sun god Surya in Hindu mythology. Uranus is composed primarily of gas and various ices. The atmosphere is about 83 percent hydrogen, 15 percent helium, 2 percent methane, and traces of acetylene. The interior is richer in heavier elements, most likely compounds of oxygen, carbon, and nitrogen, as well as rocky materials. This is in contrast to Jupiter and Saturn, which are mostly hydrogen and helium. Uranus (like Neptune) is very much similar to the cores of Jupiter and Saturn without the massive fluid metallic hydrogen envelope. 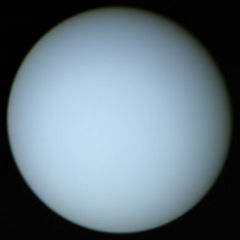 Uranus' cyan color is due to the absorption of red light by atmospheric methane. Surface temperature on Uranus' cloud cover is approximately 55 K (−218 °C or −360 °F). 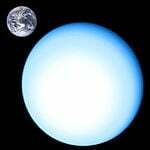 One of the most distinctive features of Uranus is its axial tilt of ninety-eight degrees. Consequently, for part of its orbit, one pole faces the Sun continually while the other pole faces away. At the other side of Uranus' orbit, the orientation of the poles towards the Sun is reversed. This gives each pole 42-years of continuous sunlight, followed by 42 years of darkness. Between these two extremes of its orbit, the Sun rises and sets around the equator normally. At the time of Voyager 2's passage in 1986, Uranus' south pole was pointed almost directly at the Sun. The labeling of this pole as "south" uses the coordinate definitions currently endorsed by the International Astronomical Union, namely that the north pole of a planet or satellite shall be the pole which points above the invariable plane of the solar system (regardless of the direction the planet is spinning). A different system is sometimes used, defining a body's north and south poles according to the right-hand rule in relation to the direction of rotation. In terms of this latter coordinate system, it was Uranus' north pole which was in sunlight in 1986. On page 47 of the September 2006, issue of the Sky at Night magazine, Patrick Moore, commenting on the issue, sums it up with, "take your pick!" One result of this orientation is that the polar regions of Uranus receive a greater energy input from the Sun than its equatorial regions. Uranus is nevertheless hotter at its equator than at its poles, although the underlying mechanism which causes this is unknown. The reason for Uranus' extreme axial tilt is also not known. In general, axial tilt of a planet can change significantly by an impact of relatively large body in the late stage of planetary formation in the early Solar System. It appears that Uranus' extreme axial tilt also results in extreme seasonal variations in its weather. During the Voyager 2 flyby, Uranus' banded cloud patterns were extremely bland and faint. Recent Hubble Space Telescope observations, however, show a more strongly banded appearance now that the Sun is approaching Uranus' equator. The sun was directly over Uranus' equator in 2007. Uranus' magnetic field is peculiar, since it does not originate from the geometric center of the planet and is tilted almost 60° from the axis of rotation. It is probably generated by motion at relatively shallow depths within Uranus. Neptune has a similarly displaced magnetic field, which suggests the magnetic field is not necessarily a consequence of Uranus' axial tilt. The magnetotail is twisted by the planet's rotation into a long corkscrew shape behind the planet. The magnetic field's source is unknown. The internal heat of Uranus is lower than that of Jupiter and Saturn. Both Jupiter and Saturn radiate more energy than they receive from the Sun. This causes many powerful convection currents to form in the atmosphere. On Uranus, that heat source is much lower due to its lower mass, with the temperature of its core roughly 7,000 K compared to 30,000 K at Jupiter's core and 18,000 K at Saturn's. The convection currents formed in the Uranian atmosphere are not as strong and, hence, it lacks the atmosphere banding of the larger gas giants. However, as stated above, the weather patterns of Uranus do vary with season, being more pronounced at the equinoxes than at the solstices. Uranus with its rings in false color. Uranus has a faint planetary ring system, composed of dark particulate matter up to ten meters in diameter. This ring system was discovered in March 1977, by James L. Elliot, Edward W. Dunham, and Douglas J. Mink, using the Kuiper Airborne Observatory. The discovery was serendipitous; they planned to use the occultation of a star by Uranus to study the planet's atmosphere. However, when their observations were analyzed, they found that the star had disappeared briefly from view five times both before and after it disappeared behind the planet. They concluded that there must be a ring system around the planet; it was directly detected when Voyager 2 passed Uranus in 1986. As of 2005, 13 rings had been identified. In December 2005, the Hubble Space Telescope photographed a pair of previously unknown rings. The largest is twice the diameter of the planet's previously known rings. The new rings are so far from the planet that they are being called Uranus' "second ring system." Hubble also spotted two small satellites. One shares its orbit with one of the newly discovered rings. The new data reveals that the orbits of Uranus' family of inner moons have changed significantly in the last decade. In April 2006, information about the color of the outer rings was published, one of them appearing spectrally blue and the other red. The rest of the planet's rings appear grey. The blue ring is thought to get its color from being swept by a moon, which may draw away all large debris, leaving only fine dust which refracts light in much the same way the Earth's atmosphere does. Uranus has 27 known natural satellites. The names for these satellites are chosen from characters from the works of Shakespeare and Alexander Pope. The five main satellites are Miranda, Ariel, Umbriel, Titania, and Oberon. ↑ Dr. Watson, Jun. of Bath, F. R. S. Account of a Comet, By Mr. Herschel, F. R. S.; Philosophical Transactions of the Royal Society of London, Vol. 71, pp. 492-501. ↑ Friedrich Magnus Schwerd, (1823) Opposition des Uranus 1821, Astronomische Nachrichten 1: 18-21. ↑ Placido Fixlmillner Acta Astronomica Cremifanensia (Steyr, AT: Franz Josef Medter, 1791). ↑ Lunine J. I. (1993). The Atmospheres of Uranus and Neptune. Annual Review of Astronomy and Astrophysics 31: 217-263. ↑ Jet Propulsion Laboratory, PDS Standards Reference—Revised: Chapter 2 Cartographic Standards. Retrieved November 16, 2007. ↑ Purdue University, Coordinate Frames Used in MASL. Retrieved November 16, 2007. ↑ University of Wisconsin-Madison, Keck zooms in on the weird weather of Uranus. Retrieved December 24, 2006. ↑ UC Berkley News, Blue ring discovered around Uranus. Retrieved October 3, 2006. Bakich, Michael E. The Cambridge Planetary Handbook. Cambridge: Cambridge University Press, 2000. Beatty, J. Kelly, et al., ed. The New Solar System, 4th Ed. Cambridge: Cambridge University Press, 1999. Karttunen, H., et al. Fundamental Astronomy, 3th Ed. Helsinki: Springer, 2000. New Moons and Rings found at Uranus, SPACE.com. Two more rings discovered around Uranus, MSNBC. Spring Has Sprung on Uranus. This page was last modified on 12 January 2016, at 15:32.